during the last weekend in August. Come grab a glass, hear some tunes, and sip away the summer. All events are all-ages, FREE and open to the public. 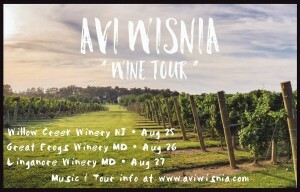 Visit www.aviwisnia.com/tour for more information. Posted Thursday, August 10th, 2017 under Uncategorized.